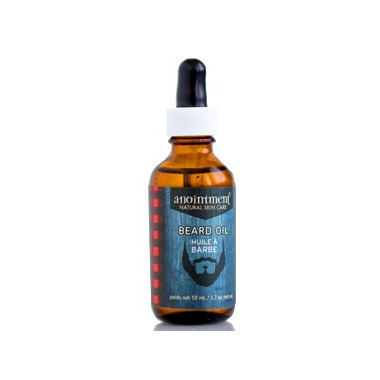 Use Anointment Beard Oil to soften dry whiskers or apply to face and neck after shaving to moisturize and soften. Contains Canadian-grown certified organic sunflower and certified organic jojoba oils. Sage, cedar and lavender essential oils help balance and calm the skin. Apply to clean skin or beard and massage gently. If desired, warm oil by placing bottle in a cup of hot water for a few minutes prior to use. Pair with Anointment Woodland Sage soap for a co-ordinated scent or to make a great gift set! This oil is amazing! My husbands beard is so soft! It doesnâ€™t leave an oily residue and doesnâ€™t make my face break out from kissing him. My husband canâ€™t wait to apply it everyday because he works outside and the elements take a tole on his skin. Bought this for my boyfriend and he likes it. It smells nice and works well. A few drops does the job. Out of the shower and rub in a dropper full of this stuff. Comb it through and you're ready to take on the day. It has softened my beard and totally taken care of the dry skin underneath. Works really well. My beard's thick, so quite a few drops are required. Kinda leaves you smelling like a lumberjack, but you get used to it. I like this product a lot. Scent isn't strong like other brands I've tried. My wife didn't enjoy the intensity of some of the other beard oils, but she doesn't mind this one. Keeps the skin under my beard from getting flaky. I find it makes my scalp feel good to, as I usually apply two drops, and rub it into my beard, then once I'm done I just run it through my hair too, just the residual oil, as my hair is pretty dry, I tried a whole drop, but it just made hair look greasy. I LOVE this oil. I bought it for my boyfriend to try and he really likes it. All it takes is 2 or 3 drops to add shine and softness to his beard. It smells wonderful too, not to overpowering.